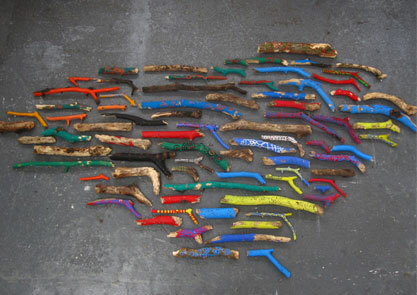 Trading Post is an exhibition of art ‘for trade’, a cornucopia of work made by artists from Birmingham and beyond. Taking a cue from the TV classic Multi Coloured Swap Shop, all the artworks in the exhibition will be available to swap. Visit the Pavilion in the Library foyer, peruse their wares and make an offer. will be made public and if the contributing artist decides to take up the offered trade the swap will be arranged. 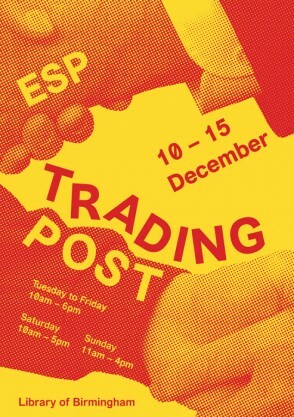 Bartering and negotiation is welcome, and encouraged. .
Trading Post is presented by ESP (Extra Special People). This project is an extension of ‘Trade Show’, a group exhibition at Eastside Projects that runs from 7 December 2013 – 22 February 2014. ESP is Eastside Projects’ associate members scheme. Matthew Raine will give a talk on Marxist Economics during which artist Faith Pearson will make a series of small sculptures available for exchange to those attending. ESP members will present a series of conversations and performances.